Barcelona has one of the more unique tourist attractions in the form of a chocolate museum. 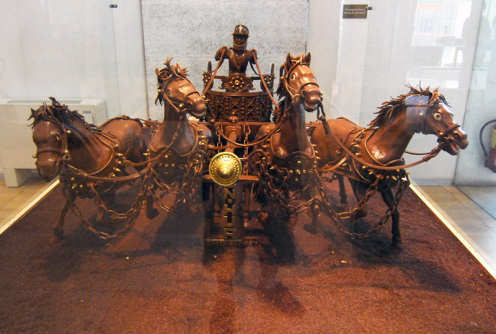 The museum exhibits a large collection of intricately carved sculptures made out of chocolate along with examples of traditional machinery that was formerly used to make chocolate during the past years. It also offers different workshops for children and adults that center on how to make chocolate. Over the course of history chocolate has served many different purposes. It has been used as a medicinal element and also served as an aphrodisiac. Chocolate has earned a good reputation because of its nutritional value and is considered to be one of the best sweet treats for people of all ages. Visitors to the region will be able to partake in guided tours of the Barcelona chocolate museum. The tour not only gives one the opportunity to see the works of art displayed in the museum but it also helps one to learn how chocolate was first discovered and the impact it had on the European nations after being introduced to the continent. Tourists will also get a chance to learn how the ancient Aztecs made chocolate along with an opportunity to see the kind of machine designed to produce chocolate in large quantity. There is a special section of the museum that is dedicated to the history of chocolate in Catalonia. Furthermore the museum has a multimedia room where guests are shown audiovisual documentaries on the history and production of chocolate. The Chocolate Museum of Barcelona is open from Monday to Saturday from 10 AM to 7 PM. Sunday timings are from 10 AM to 3 PM and at there is a small ticket fee that visitors to the museum have to pay. However, children under seven are allowed free entry. Looking at all the chocolate displays and reading about the history and production of chocolate is bound to make you feel like having some. Rest assured you are provided with the opportunity to taste some genuine hot chocolate at the Museum. A large variety of chocolate products are also available for sale in the chocolate shop set up at the museum. The city of Barcelona is generally known for its rich artistic heritage. The knowledge of the city’s connection to chocolate is not as well known. The Barcelona Confectionary Guild initiated the project of setting up the chocolate museum in the city. In order to provide their guests with an unforgettable experience the entrance of the museum leads to a boutique that is loaded with chocolate samples that are free to taste. This provides a sweet start to a sweet journey through the rest of the museum. The chocolate museum is a must-see tourist attraction for anyone who visits Barcelona, especially for families traveling with children.